Twenty Magnolias and a Scarlet Tanager! brookser	Fall Banding	Comments Off on Twenty Magnolias and a Scarlet Tanager! Friday August 29, 2014 61 new of 18 species, 14 recaps. A day that had slow winds out of the south with few birds expected, turned into a whirlwind of conference calls and picture taking. 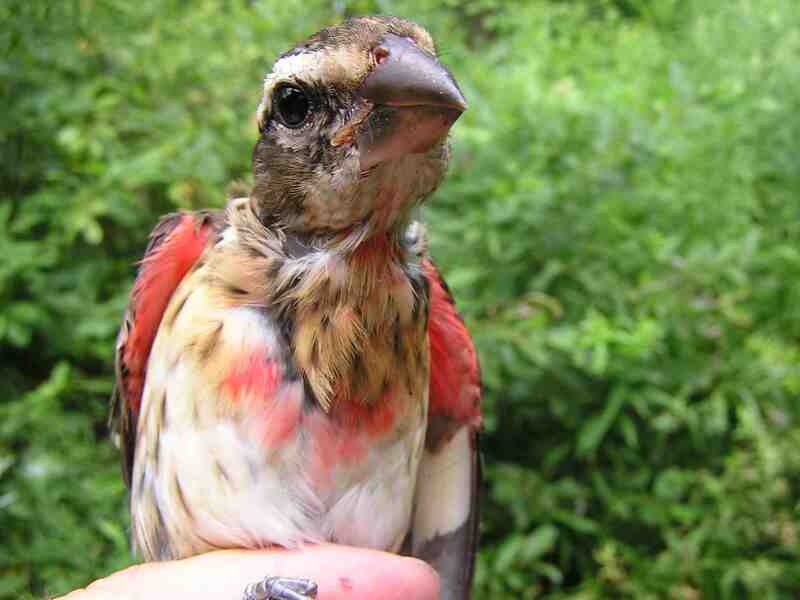 A hatch year Scarlet Tanager (photo below) turned up in the net. Since the bill looked larger than normal for a Scarlet Tanager, banders wondered if it could be a Summer Tanager. Calls and photos sent to Betsy and Ryan confirmed the bird as Scarlet. Aren’t cell phones wonderful. At one point, two aerial nets turned up over 10 birds each of which were 4-5 different species. We think the clouds of mosquitoes to feed on attracted the birds. 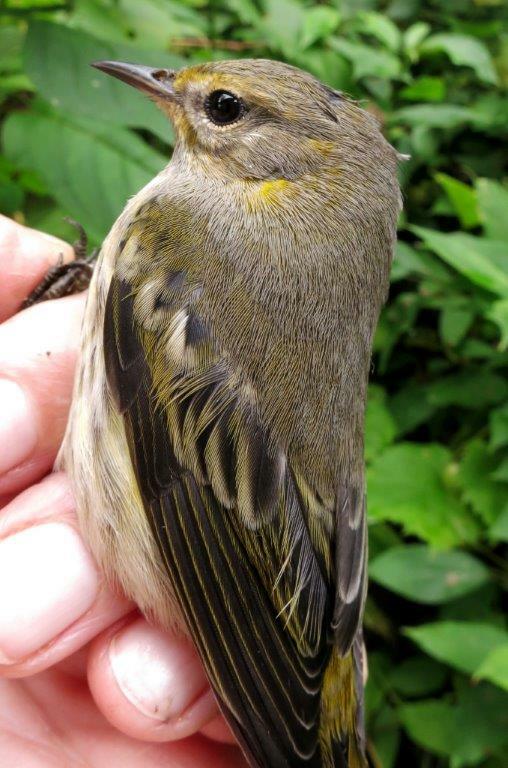 Marilyn Guenther, Jim Saller, Tom Klotzach, Pat Martin, Mark Catlin, Rich Sherman and Marian Klik helped bring in 18 species of birds, 14 recaptures and 61 new birds banded, 20 of which were Magnolia warblers. Black-throated blue, Bay-breasted, Chestnut-sided, Wilson’s and Blackpoll warblers were banded today as were a Gray-cheek Bicknell’s, and several Veerys. How wonderful to view this spectacle of nature. Thursday, August 28: 33 birds of 16 species, 9 recaps. 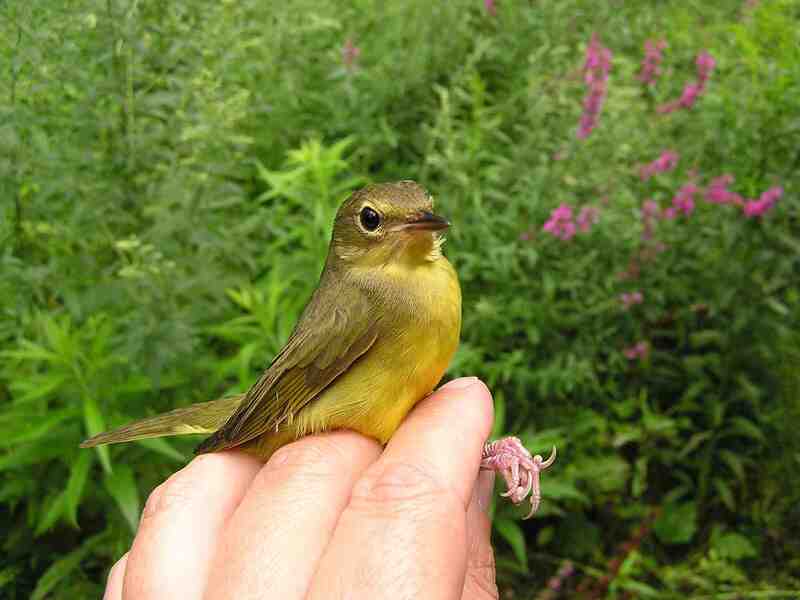 New species: Philadelphia Vireo. Birds of the day were Magnolia Warbler with 7 new bands followed by Wilson’s Warbler with 3 new bands. The weather was perfect and the winds overnight were favorable for fall migrants but we fell far short of my expectations for the day. Highlights included a nice variety of species including 8 warblers, two vireos, and two flycatchers. 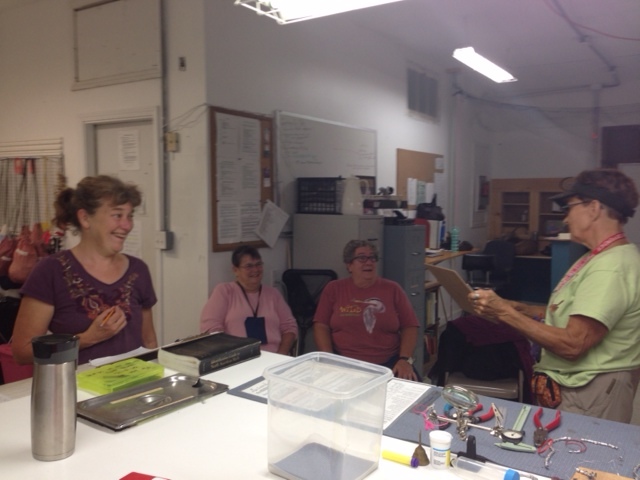 BBBO staffer Virginia Duffy, visiting from her new home in Florida, stopped by to help the banding crew today. 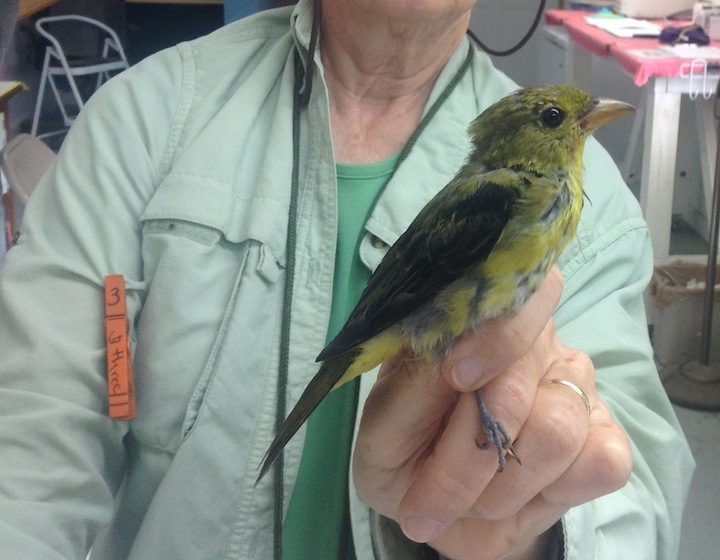 TWO CAPE MAY WARBLERS TODAY! brookser	Fall Banding	Comments Off on TWO CAPE MAY WARBLERS TODAY! Wednesday August 27. 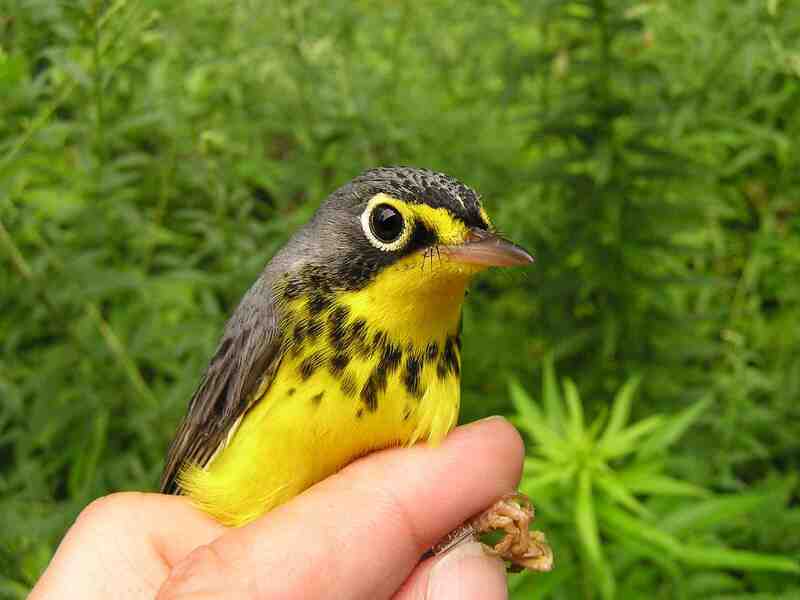 2014 31 new birds, 2 recaps; new species (2) Cape May Warblers, Veery and Wilson’s Warbler. We had a slow day, but very enjoyable birds. We did not enjoy the mosquitos though! The weather started off very muggy, but by hour 2, the breezed picked up and the sun peeked out and it was more comfortable. There were 6 Gray Catbirds banded and 6 Magnolia Warblers also. 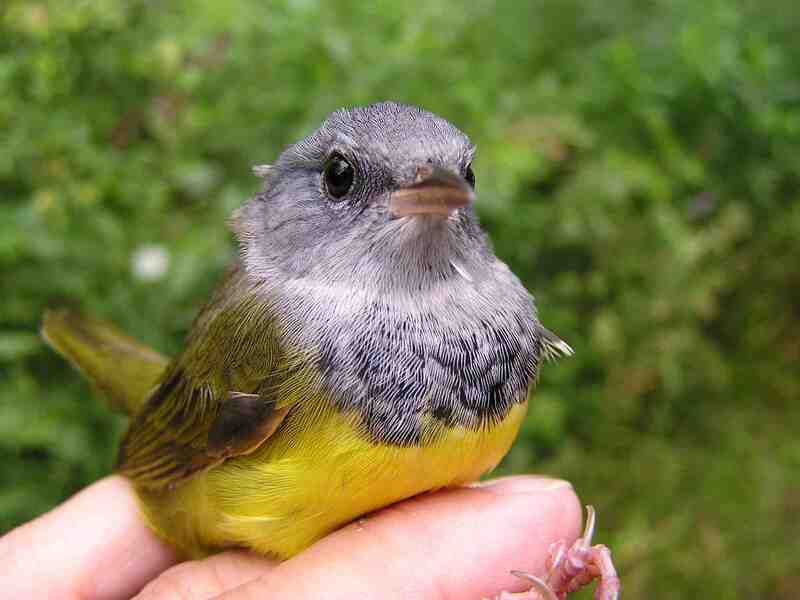 Besides the Cape May Warblers, other “eye candy” birds included American Redstart, Canada Warbler, Northern Waterthrush and Yellow-bellied Flycatcher. Tuesday, August 26: 15 birds of 8 species, 4 recaps. New species: Lincoln’s Sparrow. Birds of the day were Red-eyed Vireo and Gray Catbird, each with 4 new bands. 28 species were detected on site today. Warmer temperatures and winds out of the west/southwest combined to suppress bird counts, with the meadow nets closed near the end of the session due to the warm temperatures. Barb French observantly pointed out kettles of Turkey Vultures that were forming, along with detecting Red-tailed and Broad-winged Hawks along with 14 Bald Eagles (including several immature Bald Eagles. The Evans stopped by with their two grandchildren to say hello, and Emily Johnson from the Genesee Land Trust came out to visit and to also meet with the landscaper and assess the alder control efforts. Thank you to Gayle, Pat, Barb, Tom, Judy, and Meghan for their efforts! A beautiful day at the station for Peggy, Marian, Terry and Willie. A grandmother and grandson were guests for a couple of hours. The birds however, decided that the south wind was not good for migration. A little female Ruby-throated hummingbird was particularly infatuated with the nets in the swamp area and we captured her 4 times even if we let her go out away from the nets. A Swainson’s Thrush with one tail feather seemed to be molting every single feather on its body to the point you would think it would not be able to fly. After release, it took off like a rocket. Goes to show what we know. Chestnut-sided Warblers Breeding at BBBO??? 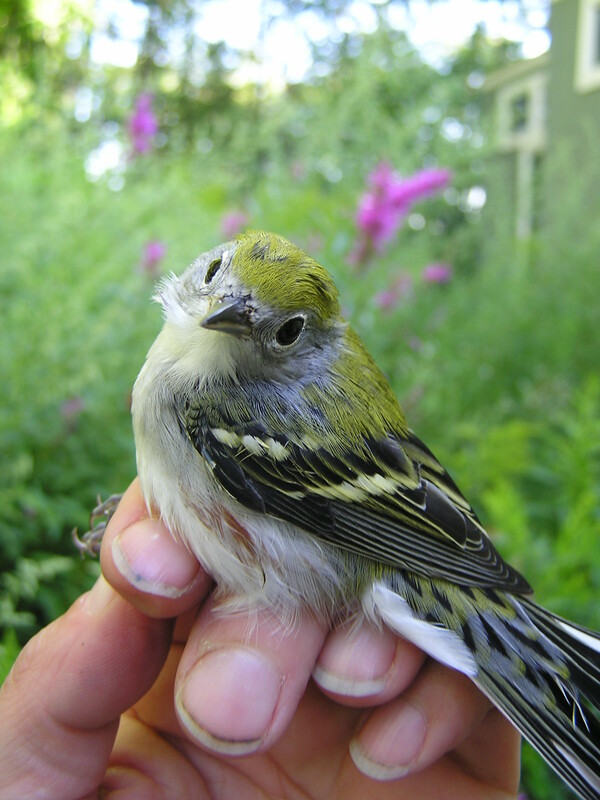 Andrea Patterson	Fall Banding	Comments Off on Chestnut-sided Warblers Breeding at BBBO??? 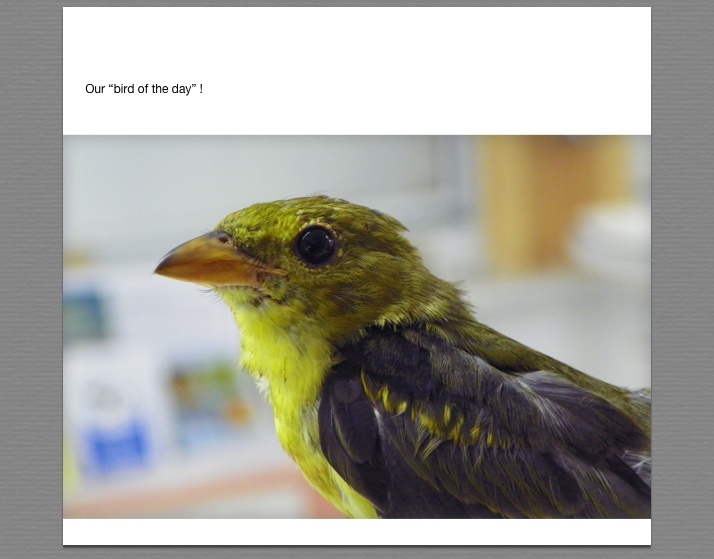 Sunday August 24, 2014: 31 new birds of 15 species, 6 recaps. New species: Eastern Wood Pewee. Things picked up a little bit today, but most of the birds were species that breed locally, such as Gray Catbirds and Song Sparrows. Two Yellow-bellied Flycatchers heralded the oncoming migration. The best catch of the day wasn’t a new bird at all, but a recapture. 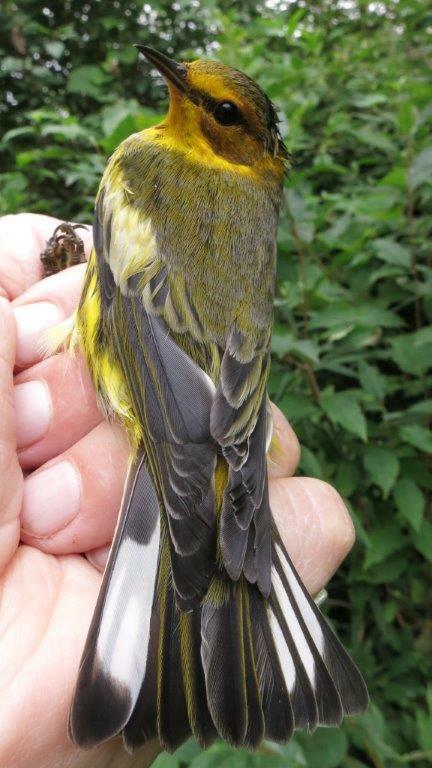 The Chestnut-sided Warbler below was first captured on July 16. A pair had been seen flitting around near one of our nets several days before, and we eventually caught this female. She had a brood patch, which suggests that she was breeding locally. Neither of the NYS Breeding Bird Atlases show breeding Chestnut-sided Warblers in the BBBO block, so it is something to watch! Andrea Patterson	Fall Banding	Comments Off on So many good birds! Saturday, August 23: 23 birds of 14 species, 4 recaps. New species: Red-bellied Woodpecker and Yellow-shafted Flicker. 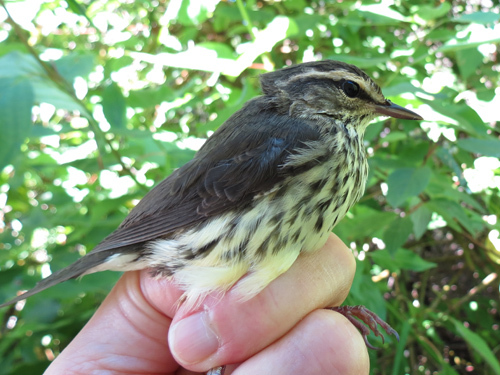 Birds of the day were Mourning Warbler and Northern Waterthrush, each with 3 new bands. 28 species were detected on site today. The morning seemed gray and oppressive. The air was heavy and nothing was moving – including the birds. We started out very slow, but after a couple hours a small breeze stirred things up and our day got more interesting. It was too hard picking just one photo, so here’s a whole collection! 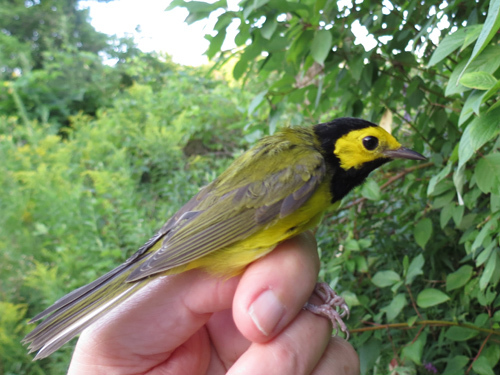 A gorgeous older male Mourning Warbler – one of three MOWA we captured today. A young female Mourning Warbler. She looks quite different from the male above. They don’t call them “confusing fall warblers” for nothing! Oh, Canada! A stunningly pretty bird. 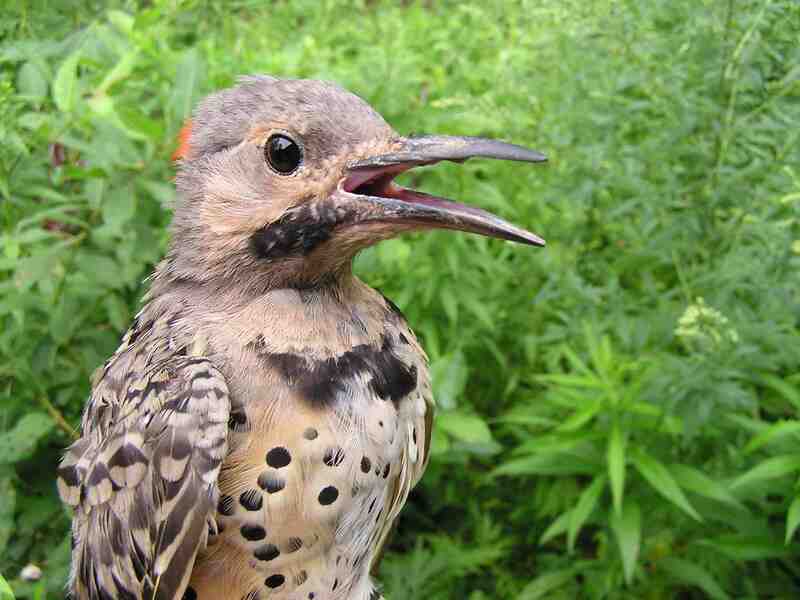 A young male flicker – one of three woodpeckers caught today. 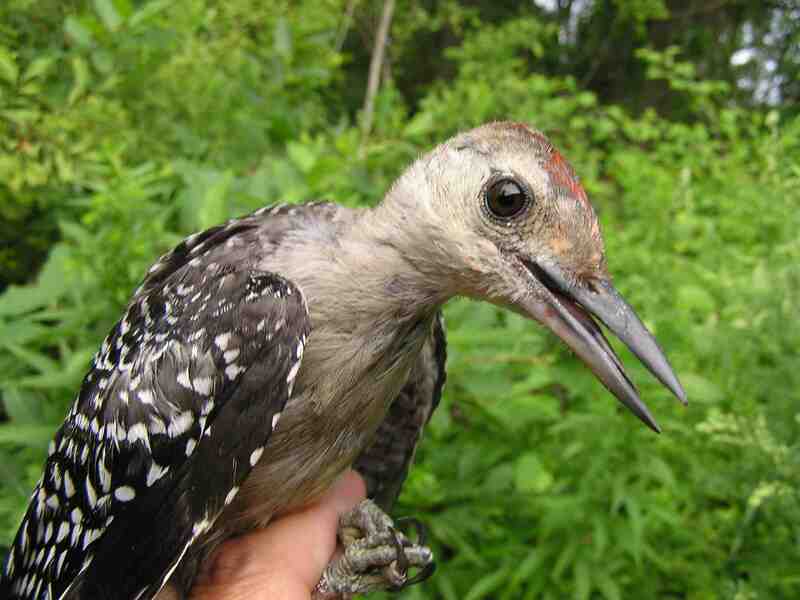 A young Red-bellied Woodpecker. Notice the brown eye, which will become redder with age. 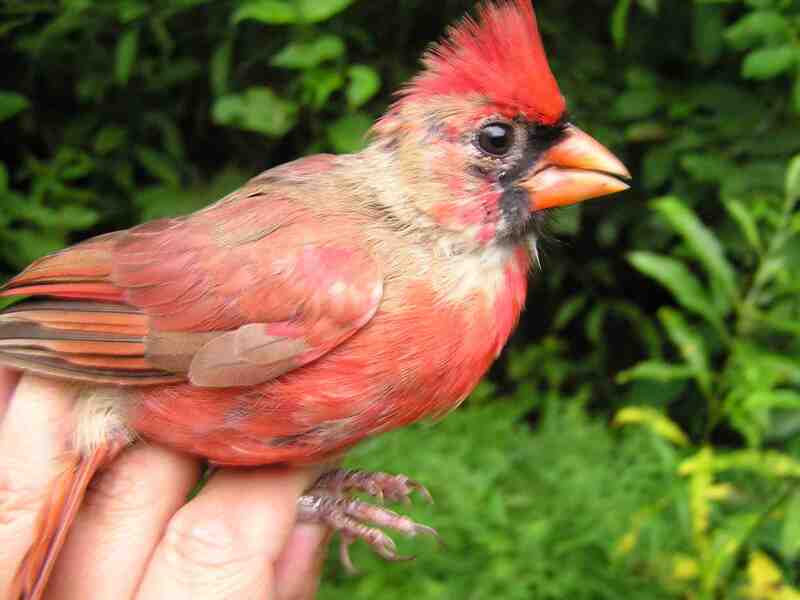 A young male Northern Cardinal, transitioning from his juvenile plumage to something more showy. Poor patchy fellow! We try not to anthropomorphize the birds, but this young male Rose-breasted Grosbeak looks awfully indignant in this photo. Like the cardinal, he’s scruffy looking now but he’ll eventually come into his own. The gorgeous rose color is already coming in under the wings and on the breast.